Spring is here and summer is fast approaching. This is the time of year that my family loves to go camping. We have an annual week long family camping trip to the Smoky Mountains and you never know what other camping trips we may squeeze in. In fact, I just did a mini camping trip with my son’s Boy Scout troop where he received his rank advancement from Wolf to Bear. This camping with kids expedition gave me the perfect opportunity to review the Coleman Jenny Lake 8P Fast Pitch Tent with Closet. 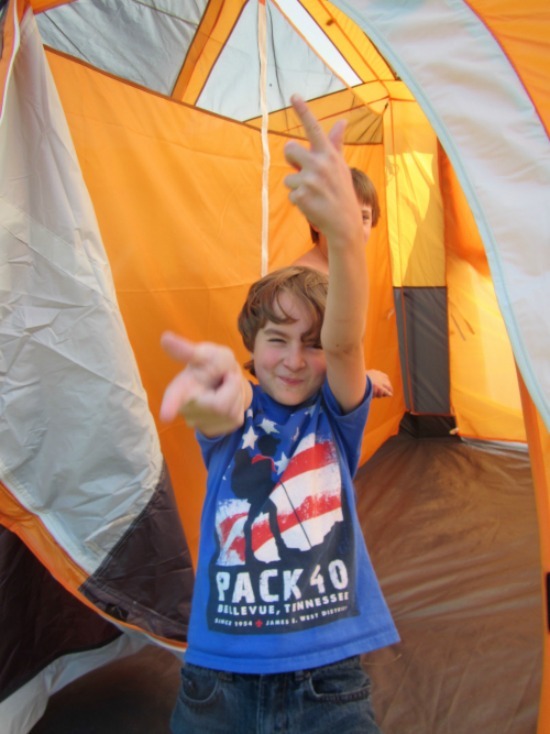 Thanks so much to Coleman for providing the Coleman family tent for review. 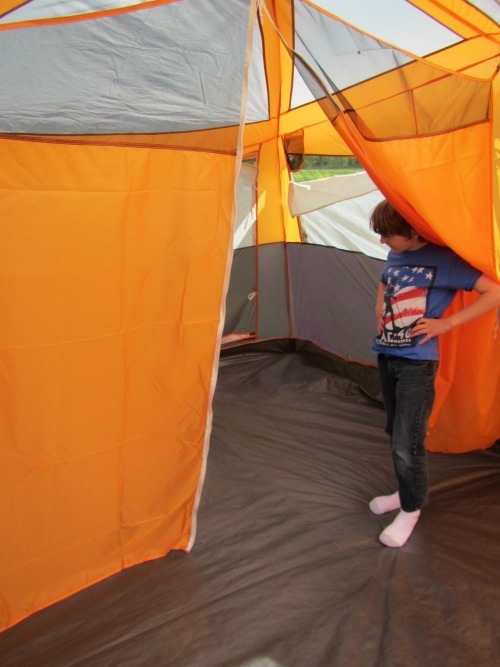 I chose to review the Coleman Jenny Lake™ 8P Fast Pitch™ Cabin with Closet because I wanted a large family tent for with plenty of room for a comfortable week long camping trip. Three of the features that stood out me about the tent besides the size were that it is fast pitch, water-resistant, and that it has a room divider. So first, let me address the fast pitch feature. 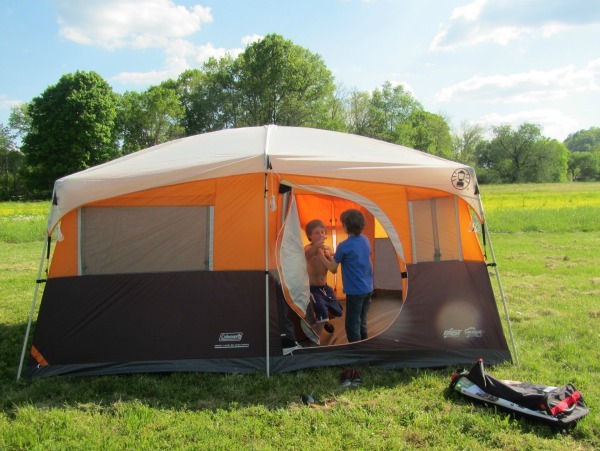 This Coleman family tent boasts a 50% faster tent set up time than a comparable Coleman® tent with conventional setup. The Fast Pitch™ system uses pre-attached, color-coded top poles and hub, fast fit feet and snag-free Insta-Clip™ suspension to achieve a 9 minute average set up time. I have to say that I had no idea how to set up the tent but I was able to figure it out in no time by reading the handy directions that are sewn into the tent cover case so you don’t lose them! (Plus, the cover case has wheels so you can easily roll it from you parking space to your campsite.) First I used the stakes to secure the tent to the ground through all the loops. Then, I simply placed the black plastic hub with the pre-attached poles in the center of the tent and quickly snapped the poles together and followed the color coding to snap into the black tent-attached assembly pieces. There was no sliding of the poles through seams because they have simple black clips that easily hook to the poles. Then I just assembled the poles and again used the color coding to know where to place them and I snapped those onto the the “fast fit feet”- little black plastic round pieces that the poles lock onto. Next we slid the fly over the top of the tent and secured it to the tent with the velcro attachments. The fast pitch tent feature does make it a pretty simple set up. It took me about 14 minutes to set it up but that was my first time and now that I know what I am doing, I am confident we could get it down to 9 minutes easily. So that is a pretty fast pitch tent! If it rains, the Coleman Jenny Lake tent is 75% more water-resistant, and the WeatherTec™ system with its patented welded floors and inverted seams also helps you stay dry. This feature is so important. I have to say that I still remember a camping trip when I was little and it rained in which I was miserable. Having said that, I can also tell you that every year we camp at the Smoky Mountains, it does rain and we have stayed dry each year in our old Coleman family tent. More water-resistant has my vote because even if it doesn’t rain, there is always dew to contend with! Having separate tent rooms was important to my husband. I guess that now that our kids are getting older, it will be nice for us all to have a bit more privacy. The room divider is an extra, removable divider that can be put up in a jiffy and has a zipper for easy access between the two areas. I must say however, that it does not provide complete privacy but you are in the same tent together so how much do you really expect? But now, I can tell my kids to go clean up their side of the tent! Yes, I am serious. There is a built-in tent with closet, shelves and hanger bar to organize gear and clothes! You can keep the shelves down and have a great place to shove your cooler and bags or you can add the mesh shelves and get organized. My son wanted to use it to organize his stuffed animals! 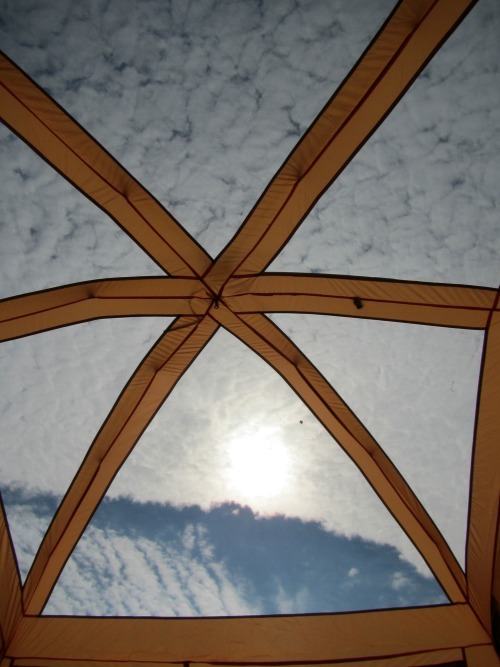 Coleman family tent roof with good ventilation and a great view of the sky! Tent in wheeled carry case. On top of all that, I just have to include in this review of the 8-Person Coleman Jenny Lake Fast Pitch Tent with Closet that it is one good looking tent! At the Boy Scout camp out, I had lots of parents asking me about my Coleman family tent and commenting on how much they liked it. I am quite happy with it and look forward to many more years of camping in this great family tent. I really like the White Water™ Cool Weather Sleeping Bag. I love the the Coleman® Get Together™ Dual Compartment Hot/Cold Tote. I really like the Coleman® Trailhead™ II Military Style Cot and have wanted to try now for sometime! Love the Coleman Instant Screened canopy for those camping trips. I also like the INSTANT CABIN 10 WITH FLY. I really like the soft sided coolers. They look so much easier to handle. I like the 12X12 FT All Day Dome. I really like the VERTEX™ ULTRA HARD ARM CHAIR. We are in desperate need for new outdoor chairs. The Glacier Basin™ 30L Ultra-Light Trek Pack caught my eye, because I need a new one! SupportRest™ Elite Quilted Top Double High Airbed – Queen looks fantastic as well! I absolutely love the instant screen canopy. Nothing ruins a fun outing more than a mosquito feast! I choose the 54 Quart Coleman Stainless Steel Cooler. It is more practical because it can be used anytime. I love the orange tent, Tent Room Divider. 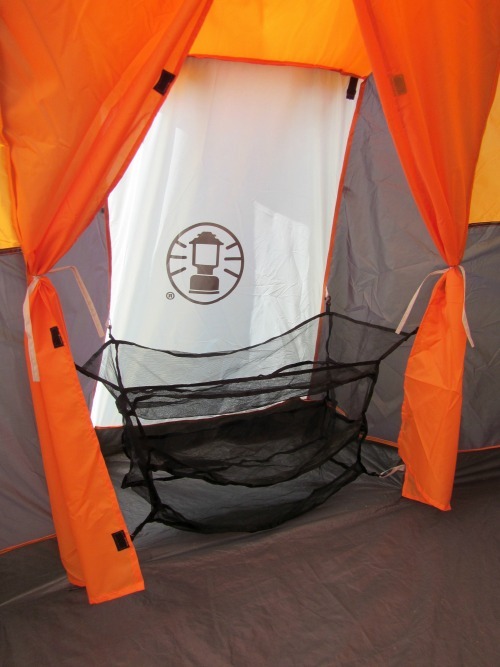 The tent lantern and stove would be great to reconnect with my kids since my devastating divorce. I like 24-Piece Enamelware Dish Set and Flatware and Camp Oven. I like the extreme lantern. We have an older Coleman tent that has been great for our family but our family has outgrown it. This Jenny Lake Fast Pitch would be perfect for our family and we have a big camping trip planned for after school is out! The FOLDING DOUBLE WASH BASIN looks really useful. This would be great for many uses! One would be when the grandkids come to visit in the summer we could set it up in the backyard. Another would be to take them camping near a stream. I love camping so i love coleman coz when you have their product with you its a big help and take care of everything. you had me at the camp coffeepot!!!!! I like the looks of the SUPPORTREST™ PLUS PILLOWSTOP™ DOUBLE HIGH AIRBED – QUEEN. The Hot Water System would make camping more tolerable. I really liked the camp wagon, very versatile. i really like the INSTANT CABIN 10 WITH FLY tent the best ! wow that’s like a spa tent! If only it came with feather beds! The Willow Creek™ Contoured Sleeping Bag and Treklite™ Plus Coolerpack Chair caught my eye! I love Coleman products and have several items…my Dad is a registered Master Maine Guide,so we do lots of camping,hiking,fishing,etc….I grew up using Coleman products…I could stand to replace my lantern and chairs and probably my cooker soon! I love the vertex hard arm chair! I like the LED lanterns. I would like one of the air beds to go along with a tent. Grandma as a heard time sleeping on the ground. My hubby, grand-kids, and I love to go camping. I like the SUPPORTREST air bed and the HATTERAS™ FAST PITCH™ SHADE WITH DRINK SLEEVE from Coleman’s. I WOULD LOVE TO HAVE THE TREKLITE PLUS COOLERPACK CHAIR. THIS WOULD DEFINATELY COME IN HANDY! A couple of ComfortSmart Suspension Chairs would be great. The NXT™ 200 Grill Caught My Eye! The Vertex™ Hard Arm Chair caught my eye! 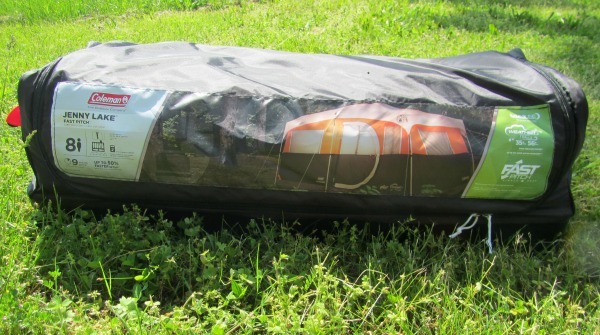 oh my goodness the Queen size Durarest looks perfect for camping trips! ELITE MONTANTATM 8-PERSON TENT would fit my whole family and guests! I like the Pack-Away™ Outdoor Picnic Set For 4. Our family would definitely use that when we go camping. I like the camping stoves. They would be perfect for traveling. Thank you for the giveaway. My wife would love the HOT WATER ON DEMAND™ PORTABLE WATER HEATER and the SPRAY ADAPTER because then she could even take a nice hot shower in a secluded place while she was camping. http://www.coleman.com/product/9-cup-coffee-percolator/2000016430?contextCategory=5180#.VVNJDflViko 9 CUP COFFEE PERCOLATOR would be the perfect way to make my favorite cup of coffee after spending a wonderful night out with the family. Thanks for the chance at winning an amazing prize that would be used for many years. I like the airbed cot! It looks comfy and I’ve never liked just an air mattress on the ground. We are currently looking for new sleeping bags… the double/2 people sleeping bag looks awesome! I really liked the SUPPORTREST™ DOUBLE HIGH AIRBED – QUEEN. It would make camping more enjoyable. i like the AIRBED TWIN COT WITH SIDE TABLE W/ 4D COMBO as my son wont sleep on a regular cot and i am sure he wont lay on ground in sleeping bag so this would be a theory to test. The Durarest Plus Double High Airbed would be a great addition to this tent. I like the 16 QT excursion cooler. Thanks for hosting! The Treklite™ Plus Coolerpack Chair really caught my eye! With a chair like that, you’d never need to get up….. well, except to use the bathroom maybe!! Totally awesome chair! I would like to also have the SupportRest™ Plus PillowStop™ Double High Airbed – Queen. I like the support bed air mattress. Would make camping like being home only better. I liked the large sport collapsible cooler. It would be great for camping and also bring food home from the store in the heat. The CPX 6 Rechargeable Power Cartridge would be helpful! I like the north rimtrade extreme weather sleeping bag. I like the kickback breeze chair! I could use a couple of the Coleman 24 or 48 can Party Stacker Coolers. Love the idea of using color to designate what is in that cooler. They have a lot of great chairs. The Coleman® ComfortSmart™ Suspension Chair looks really nice. The instant screened canopy would be fantastic! I love the kickback breeze chair! The camp oven caught my eye. I really like the INSTANT SCREENED CANOPY 12 FT. X 10 FT. We hold much of our church Vacation Bible School outdoors and this would be a great classroom. One of the items that caught my eye is the INSTANT 2-FOR-1 TENT AND SHELTER WITH PORCH. oooh I like the Coleman® Signature Portable InstaStart™ Stove/Oven. I love the 54 QUART COLEMAN STAINLESS STEEL COOLER, perfect for family camping. Looks like good family fun! I am really interested in the Camping Coffeemaker. I like the Outdoor Picnic Set. I really like the Coleman Outdoor Picnic Sets. The foldable tables with attached benches are really nice. I love the 10×10 ft all day dome (canopy) and of course, the coffee maker you have. Outdoor 4 piece picnic set! I like the personal wheeled cooler and the NFL cooler on wheels. The Camp Wagon is an item I believe everyone should have as there is so many uses for this item. This be so perfect for our grandchildren (whom we are raising) and us. They already love to fish, now to get them camping!! Thank so much for the opportunity. I want a PREMIUM DUAL FUEL™ LANTERN WITH HARD CARRYING CASE too. SUPPORTREST™ PLUS PILLOWSTOP™ DOUBLE HIGH AIRBED – QUEEN. The 50 Quart Wheeled Xtreme® 6 Marine Cooler really caught my eye! It can keep ice up to 6 days in 90 degree temps! Wow! I love the CAMP WAGON would make things so much easier to load and unload and to take to the beach at the lake! I would love to have the Trailhead™ II Cot. Camping is one of our favorite activities this time of year and I would love to update some of our gear before our next trip. I would love to have the Coleman 8-Piece Enamel Cooking Set and a couple of the CPX™ 6 TRIAGO LANTERNS. i love the duralast beds! they are so comfy its almost like sleeping on a real bed! I really really need this tent! We are going camping this weekend and the hubby refuses to bring the big tent becasue it leaks and it may rain. So i am going to be forced to smell my teenage boys feet! Need a new big tent for me and the girls and the guys can smell each others feet in the little tent! I would like to have the FAMILY COOK SET – 6 PIECE. I like the WEATHERMASTER® SCREENED 6 TENT. The GLACIER BASIN™ 23L ULTRA-LIGHT TREK PACK caught my eye. I love the party stacker coolers! I really love the Converta cot, great for extra sleeping for the kids! i really like and could use the SUPPORTREST™ DOUBLE HIGH AIRBED – QUEEN sized …..looks super sweet. I like the ’60QT WHL Fire Dept. Crest’. It’s a cooler with a fire department sign on it. AND it’s on clearance right now! Love Coleman products. High quality and affordable! Have you had a chance to have this tent in the rain? Wondering how well it does int he rain. We are using our Coleman Packaway cots (http://campingandcamping.com/coleman-pack-away-cot-with-side-table-review/) for 3 years already. We have two of them (me and my wife). We mostly go camping in the warm season, but we also go at least 5 times camping in winter. These cots are simply amazing. They are very sturdy and super convenient. The table is the best thing about it. This is my third camping cot. Previously I have been using a no-name camping cot and then I have been using a simple Coleman ComfortSmart Camping Cot, but I was too simple. Squeaky and too weak. I recommend the one I am using – Coleman Packaway cot. Good value for money, guys.